New technologies are supposed to make life easier, but it seems to me that everything gets more and more complicated instead. Rather than asking something of somebody, one has to address a system and work one’s way towards the answer algorithmically. Instead of picking up a pen and putting it to paper, one presses a key which is linked to a circuit which activates an interface which communicates to a printer which prints out a character that looks a lot more primitive than anything an Assyrian grain merchant might have scribbled onto his delivery note slab almost 3000 years ago. We had a new and improved photosetting fount. It was soon learned however that this simply wasn’t good enough. 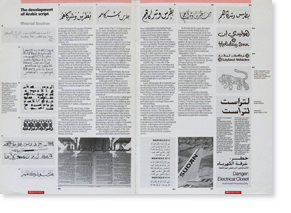 We have some technologies, which define the look of a typeface by limiting the amount of digital information available, while at the same time we have other technologies, which draw a character more precisely than any human hand could ever do it – as least not so fast and repetitively. 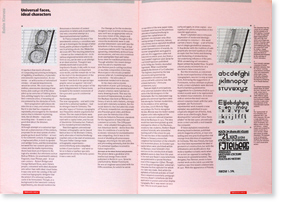 There always has been and there always will be a demand for new typefaces – designs, which express the feeling of a period as accurately as the length of ladies’ skirts or the shape of car radiators. Sociologists and art historians alike could make this an exciting new field of research – ‘tell me the typeface and I’ll tell you what the fashion at the time was’. 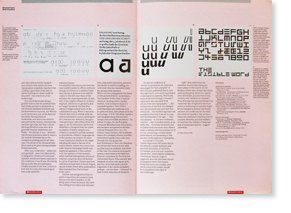 But apart from typefaces that express the mood of a period or a certain society, or simply that of the designer who is responsible for it, there are technical and economic conditions, which might demand different solutions from all the other’s previously available. Telephone directories, bibles and office stationary all need type, but with vastly different priorities. To pick out a figure from amongst a few thousand other figures poses a different question than impressing clients with a well, printed business report. 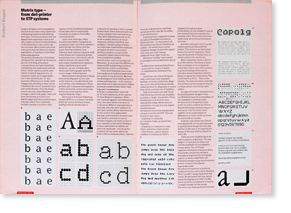 The special feature in this issue of Baseline deals with ‘type for a purpose’; the continuing quest for the universal typeface to end all other typefaces, the demand of tradition as well as economy on a specific design, the limitations of technology, and the development of technologies where type is concerned. 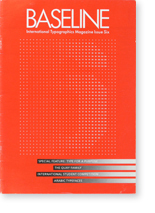 The subject will also appear in future issues of Baseline; there will be reports on type designs for telephone books, transport signage systems, corporate design programmes, all written by the people who know best the designers themselves. 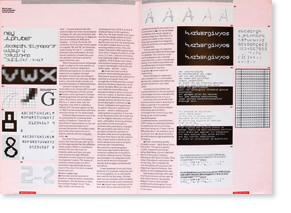 There is no communication without type, and type has designed by specialist designers, not by engineers or accountants – it seems that the information industry has just got that message. A typeface that meets all needs: of composing and printing techniques, of legibility, of aesthetics, of phonetic and semantic representation. At one stroke – or with a series of rationalised strokes – all special requirements would be solved. We could stop the endless uneconomic, devising of new forms, and could get rid of the dross piled up by centuries of fiddling invention, settling happily for a world of purified communication, of meaning un-cumbered by the obstacles of form. Arabic belongs to the group of Semitic languages and most scholars now agree that Arabic script, which eventually came to predominate, can be traced back to the Nabataean script, which dates from the third century AD. Nabatean script evolved into what became known as North Arabic or North Semitic script and further developments produced the static angular script known as Jazm.